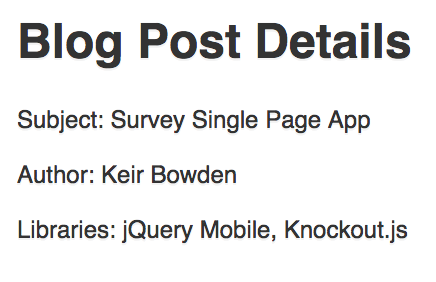 I’ve written a number of survey applications in the past, some aimed at desktop devices and some aimed at mobile. The common theme for all of these was a round-trip to the server to navigate to the next or previous question, which resulted in a number of abandoned surveys started by people with a less than ideal internet connection. To improve this, I created a Single Page Application, which delivers all of the pages required by the application to the device in a single response. The application retrieves and updates data from the server via API calls rather than carrying out potentially expensive HTTP round trips to the server. 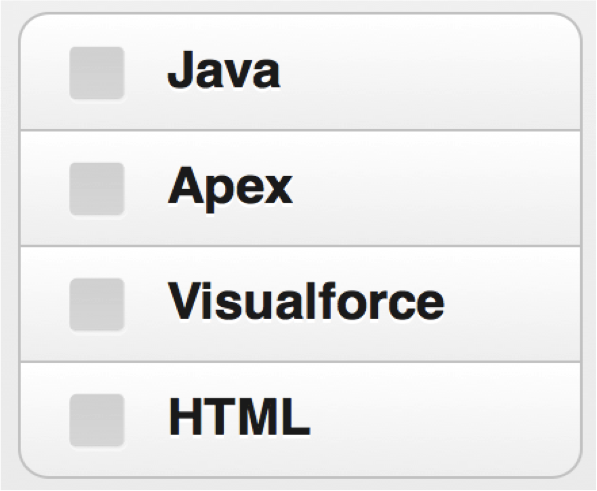 For more details on the architecture and pros and cons of Single / Multi Page applications, see Architecting Performant HTML5 Mobile Applications on Force.com: Part 3. 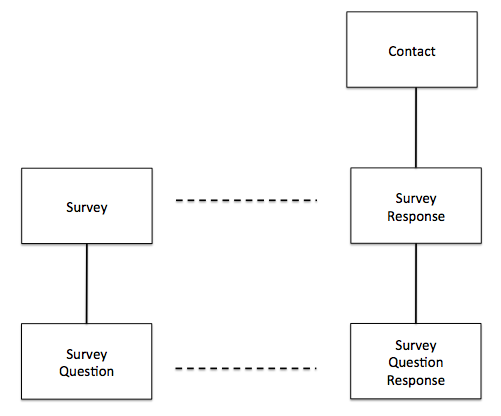 The left hand side of the data model is the template survey information – a Survey contains some introductory text and a number of Survey Questions. This is separated from the response data, as I want to be able to change the questions in a Survey without affecting any Surveys that have already been completed, as that could invalidate answers. When a Survey is sent to a contact, the Survey and associated questions are cloned into a Response that is identified by a unique, non-predictable code, to stop anyone manufacturing codes and answering surveys that they haven’t been sent. To style my application, I’m using jQuery Mobile (JQM), mainly because I’ve been using it for over three year now and I’m very familiar with it. JQM is a user interface framework that provides a mobile look and feel for HTML5 web applications. Its purely concerned with presentation, so doesn’t manage your data or provide a business logic layer. Its touch optimised, which means its designed primarily for touch screen interaction. It supports a wide range of devices ranging from phones and tablets to e-readers and desktops – the latter is particularly useful when developing an application, as it allows you to build and test on your desktop or laptop, with access to better tools to debug and inspect the application than you would have on a mobile device. The first layer is regular HTML, which won’t look particularly great but will be functional. Older devices and browsers are still able to access the content, but it won’t be as slick as it would be on a modern smartphone. The second layer is CSS, which enhances the view. These are not standard HTML attributes, instead they are a way to store additional information on the element which has meaning to the application. In this case, JQM knows that when it encounters the data-role attribute, it needs to apply styling to enhance the element. If JQM was removed from the application, this attribute would be ignored. A physical Visualforce page in a JQM application can contain one or more logical web pages, which allows a Single Page Application to be created. JQM naturally lends itself to Single Page Applications when used with Visualforce, as it hijacks page navigation and form submission, resulting in competition rather than cooperation. In this snippet there are two divs with the data-role of page, which equates to two web pages. When the application is opened, the web page contained in the first div is displayed, while clicking on the link swaps the content of the first logical web page out of the DOM and swaps the content of the second logical web page in. Question page, which displays the question, inputs and any buttons required. This page is updated as the conact navigates through the survey. Knockout is a Model-View-ViewModel framework that reduces the need to write code to manipulate the DOM by allowing you to declaratively bind data to an HTML element. The user interface can then be automatically updated when the value changes, rather than having to locate the element in the DOM and push the new value into it. The bindings demonstrated above are static, where the power of Knockout becomes apparent is through Observables – these are two-way, dynamic bindings that notify subscribers about changes. Binding to an Observable means that if the value of the property is changed in the ViewModel, the DOM will automatically update to reflect the change, and user input is automatically captured in the ViewModel property. In my application, I have a ViewModel Observable named ‘current_question’, which contains the metadata about the question to present to the contact and their response. The following markup conditionally renders a textarea form element based on the type of the ‘current_question’ Observable, and binds the response for the question to the textarea, so that anything the contact enters into the textarea will automatically be written to the response. If you’d like to learn more about Knockout, there’s an excellent set of interactive tutorials. // be used for any other purpose! After a considerable amount of trial and error and digging around on message boards and forums, I was starting to worry that what I was trying to achieve wouldn’t be possible with JQM and Knockout, I finally hit upon a solution – the Knockout appyBindings method can be called multiple times, to allow new markup to be dynamically injected into the page and still bind to the ViewModel. I could therefore replace the input section completely, attach this to the ViewModel via the applyBindings method and then trigger the create event on the input section, which would cause JQM to enhance the new markup. The full codebase for this application is available in GitHub. Keir Bowden (aka Bob Buzzard) twitter.com/bob_buzzard, is a four-time Force.com MVP and CTO of BrightGen, a Platinum Cloud Alliance partner in the United Kingdom. He holds all 8 Salesforce certifications and is a regular blogger on Apex, Visualforce, and Salesforce1 solutions at The Bob Buzzard Blog, and author of the Visualforce Development Cookbook.